Starting January 1, 2019, all Washington State employers (with very few exceptions) must begin collecting Paid Family and Medical Leave premiums via payroll deduction and company contribution (if applicable). The total insurance premium for 2019 is 0.4% of an employee's gross wages, and the employee and employer may split the payment. Visit the Washington Paid Family & Medical Leave Help website for important additional information, to determine if you are subject, and a premium calculator. This tax is supported by QuickBooks Desktop and QuickBooks Online Payroll. Unified Business Identification (UBI) number: The account number that identifies your company to the agency. There will be a field in the setup that asks for this number. Employers must collect and remit premiums starting in 2019 with the first payroll of the year. Once created, this will be collected per paycheck. New payroll taxes will be added to the payroll system. The total employee and company contributions for 2019 is 0.4% of the employee's total gross wages up to the Social Security limit. *Employers with fewer than 50 employees are not required to pay the employer portion of the premium. An employer can elect to pay the employee’s share of the premium. This is not currently supported by Online Payroll. Important: Quarter 1 and Quarter 2 2019 premium payments and reports for Paid Family and Medical Leave should be submitted between July 1 - July 31, 2019 instead of in April. This change applies to 2019 only. In QuickBooks Desktop, enter the amount as 63 for the employee portion and 0 for the company portion with no percentage sign or decimals. If the employer elects to pay the employee premium, enter 63 in the company portion and 0 in the employee portion. Employers with MORE than 50 employees (where Employer opts to cover the Employee portion)* Effective April 2019, this option is going to be available for Online Payroll customers. In QuickBooks Desktop enter the amount as 63 and 37 with no percentage sign or decimals. Follow the steps under your payroll service (Desktop or Online) to set up item. Select the Gear icon at the top then Payroll Settings. Select State Taxes - WA. Effective January 4, 2019 the WA Paid Family Leave rate will automatically be set to .6333% for the employee and 0% for the employer for all customers. At a future date, employers with 50 or more employees will be automatically adjusted to .6333% for employees and .3667% for employers. Beginning April 2019, the option to cover employee contribution will be available.If you would like to make adjustments to the rate now, please contact us to set up this item for your company. After you install the December QuickBooks Payroll update, the Add Payroll Item tool will help you create the 2 new payroll items. Follow the on-screen wizard to set up the item. For each new Payroll Item, add the employer account number and vendor name. This is needed for the payment due in the first quarter of 2019. Important: If you’re asked during the interview if this rate is part of the UI rate, select No. 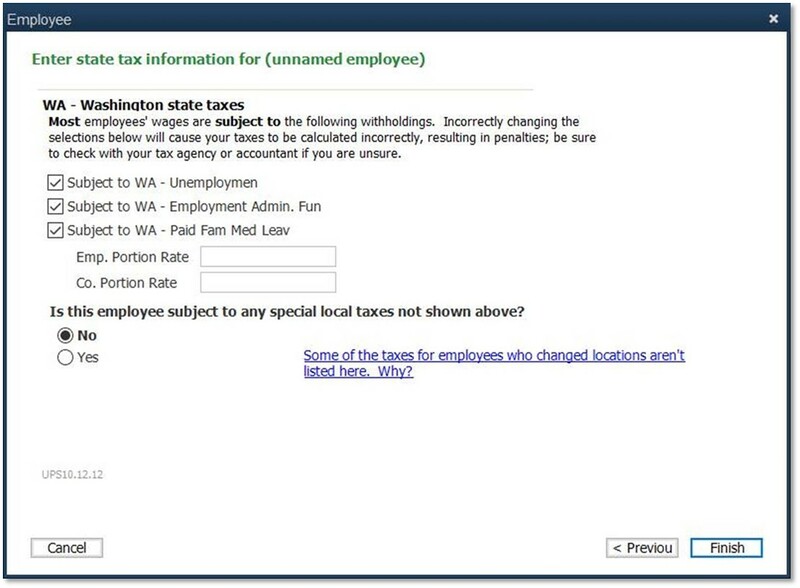 The tool will create two new payroll items related to the WA tax. WA – Paid Fam Med Leave Emp: Employee portion of the total insurance premium will be added to the Payroll Item List. WA – Paid Fam Med Leave Co: Employer portion of the total insurance premium will be added to the Payroll Item List. It will offer the option to assign both Payroll Items to each employee. After the Payroll Items are added, go to each employee tax setup to enter the percentage of the total insurance premium or 100% of 0.4% of employee wages. NOTE if your employees earn Tips see the FAQs below. Go to Employees then select Employee Center. Double click the employee name to open the Edit Employee window. Go to the Payroll Info tab and select Taxes. In the Taxes screen that pops up, select the Other tab. Go through the payroll setup wizard. In the Employee setup screen, put a check mark on the Subject to WA – Paid Fam Med Leave box and complete the Emp. Portion Rate and Co. Portion Rate fields. Intuit does not support the payment and filing for the products below at this moment. We’re still waiting for information from the agency. Please return to this article for updates. Note: Payment and filing for quarter 1 and quarter 2 2019 is due on July 31, 2019. Can an employee be exempt from the Washington Paid Family and Medical Leave tax? Yes. Check with your state if you are exempt from this tax. To set up your payroll file as exempt. Desktop Payroll: Enter 0 (zero) for both employee and employer amounts. Next to the withholding section select the edit (pencil) icon. Scroll down until you see Tax exemptions. Ensure the tax is selected. Select Employees then select the name of the employee. In the Taxes and Exemptions section, select Edit. QuickBooks Online Full Service Payroll and Intuit Full Service Payroll, contact us for support. If Online Payroll does not currently support the ability of an employer to elect to pay the employee’s share of the premium, is there another option?Effective April 2019, employers will have the option to cover the employee's contribution. In the meantime, employers can use the reimbursement pay item to repay the amount collected to the employee.Employers who are currently using the workaround to reimburse employees can switch as of April 2019. However, they can also continue to use this workaround as it does not change how filings are created or filed. What if I followed the steps in this article to set up the items, but the rates are still zero? Go back to the Pay Employee workflow and right-click on the employee name and select Revert paycheck. Repeat for each employee in the pay schedule. If the tax calculated is still zero, review previous paychecks to see if the tax was over collected in previous paychecks. QuickBooks will automatically adjust current paycheck if previous ones were over collected. What if I have an employee with tips? Basic, Standard, and Enhanced Payroll customers ONLY: If your employees earn tips, you must edit both tax items. Update to the latest tax table. From the Payroll Item List, edit the WA – Paid Fam Med Leave Emp and WA – Paid Fam Med Leave Co payroll items. Select Next until you see the Taxes window. In the Taxes window, select Default. Select Next until you see Finish, then select Finish. Create a Payroll Summary report for the time period you have already paid. Export the report to Excel. Follow the steps above to correctly mark the payroll tax items. Enter Employee liability adjustment per employee for the amount of tips in negative in the wagebase box. QuickBooks will account for any amount over collected and adjust these taxes on future payroll(s). Assisted Payroll ONLY: If your employees earn tips, and you have NOT paid any employees with tips, you must edit both tax items. 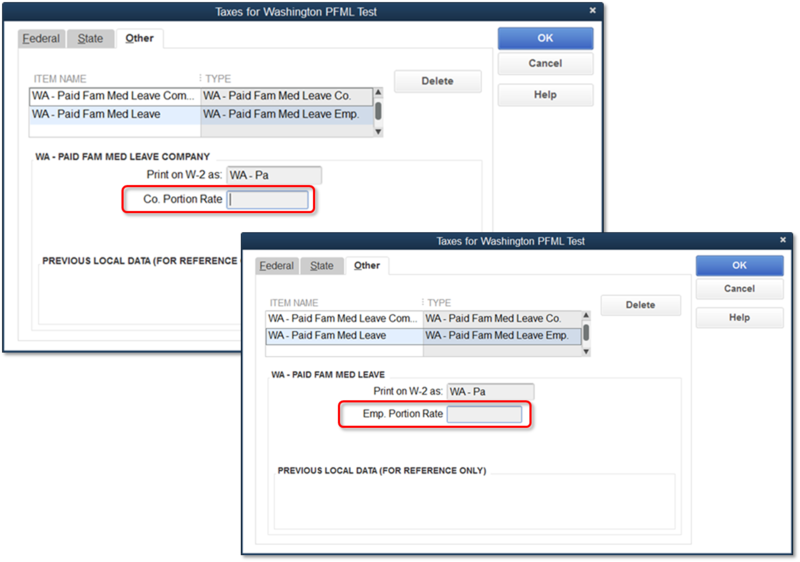 Select Next until you see the Taxable Compensation window. In the Taxable Compensation window, select unmark all tips payroll items. Assisted customers who have paid employees with tips, contact customer service for support.